Our second week in Taiwan took us from Taichung to Sun Moon Lake and back to Taipei. So far Taiwan had demonstrated that it has something for everyone from history buffs to foodies. On the second part of the journey in Taiwan, we were hoping to find out more about the local art scene and to also chill out at Sun Moon Lake, as well as to enjoy the gorgeous scenery that we had heard so much about. In order to secure reserved seating and not to make the same mistake, we decided to get our train tickets for our last leg of the journey from Taichung to Taipei once we got into Taichung station as we did not want to be standing again. The tickets cost $180NT per person. Taichung is located in central western Taiwan and it's the 3rd largest city in Taiwan. Taichung is also well known for it's art scene offering various types of art forms from street art to performing arts. One thing to take note of while visiting Taichung is that all buses are free within a 10km radius of Taichung city centre, therefore you can just hop on the bus to take in many of the tourists attractions as long as you have a tap on tap off card. We took buses everywhere we went to in Taichung and the bus journeys were not difficult to navigate. You can pick up a bus guide from the tourist information centre or my preferred option was to use google maps and google trips to plan our journey. There are many museums and cultural centres that you can visit while in Taichung. We visited the National Taiwan Museum of Fine Arts and the National Taichung Theatre during our stay, but do check the opening times as most museums are closed on a Monday. The National Taichung Theatre was designed by Japanese architect Toya Ito with a very interesting and impressive architectural style. The theatre does not consist of any hard and artificial lines. You will find its surface covered with curves and the interior filled with natural flowing space to demonstrate a flexible and flowing design. There are daily tours of the National Taichung Theatre if you understand mandarin or you could just wander around the building. One place not to be missed while visiting Taichung is the rainbow village. The rainbow village was created by one man wanting to save his settlement from being torn down by the authorities. In order for Mr Huang Yung Fu to save his settlement from demolition, he decided to start painting it. His colourful work of art included birds, animals and people. The original settlement had about 1200 homes however most of the homes became run down and were snapped up for redevelopment by property developers. Many people were offered resettlement but Mr Huang made the decision to remain, even after most of his neighbours had left and there were only 11 homes remaining. Mr Huang painted both the inside and outside of the remaining homes and his work grew from there. With the help of local university students, they started a campaign to save the rainbow village. Authorities did give in finally and agreed to preserve the rainbow village. Statues of Mountain Goats in Taichung Park. The next stop for us from Taichung was Sun Moon Lake. Getting to Sun Moon Lake from Taichung was pretty straight forward. There is a direct bus that takes you there however there are a few options: you could get a single or return trip as well as a tourist pass which included attractions around Sun Moon Lake. We decided to go with one of the tourist passes that included a return journey to Taichung, a bus trip round Sun Moon Lake, a day ticket for ferries round the lake and a return journey on the Sun Moon Lake rope way costing $720NT each. This may sound like a lot but if you added up a the individual tickets you do make a huge saving. View of Sun Moon Lake from the Rope Way. The weather took a turn for the worse during our journey to Sun Moon Lake and it would continue to rain for the rest of our time in Taiwan. As it was the summer, we were not prepared for the monsoon rain that came over from Sri Lanka. On arrival at Sun Moon Lake we decided to purchase ponchos which were a life saver. The bus drops you off near Shui She Wharf which is the biggest town ship at sun moon lake, this is where you'll find bigger establiments like Starbucks etc and it's also busier and more commercialised. We wanted a quieter and quaint area just to relax for a few days so we choose a place called the lake inn at Yi Da Sha, which is located on the Southeastern banks of Sun Moon lake. Drifting through the clouds on the rope way. To get from Shui She to Yi Da Shi, you can either take the ferry or the round the lake bus. We went with the latter due to the weather and wanted to keep ferry vouchers for another day. Entrance to Formosan Aboriginal Cultural Village. I was hoping to catch some beautiful landscape photos while at Sun Moon Lake but this was impossible due to the adverse weather conditions throughout our stay. We still used up all the vouchers that were included with the tourist pass, taking the ferry to three piers around the lake and still went on the the Sun Moon Lake Rope way (a cable car ride). The Sun Moon Lake rope way connects the lake to Formosan Aboriginal Cultural Villiage. If you have time the Cultural Villiage seems like a day out for families as it includes a huge themed park. We did not get the chance to visit it due to time constraints and the weather. From Sun Moon Lake, we took the return bus journey to Taichung and caught a train to Taipei to spent our final 3 nights in Taiwan. Temple along Meng Xia old street. We decided to stay in the hip and trendy area of Ximen for our last few days in Taiwan. Ximen is know as the Shibuya area of Taiwan where there is plenty to eat and many shops around the area. There are also night markets and historical buildings to explore near the vicinity of Ximen. If you are staying in this area I would recommend that you go to Meng Xia old street and Bopiliao Historical Block to experience what was it like to be in the Taipei of old. Meng Xia old street is still filled with residential homes and local shops. Bopiliao Historic Block has been converted into an exhibition space as well as housing a permanent exhibit that portrays the history of the area and how people used to live. Main course served in miniature toilet bowl. 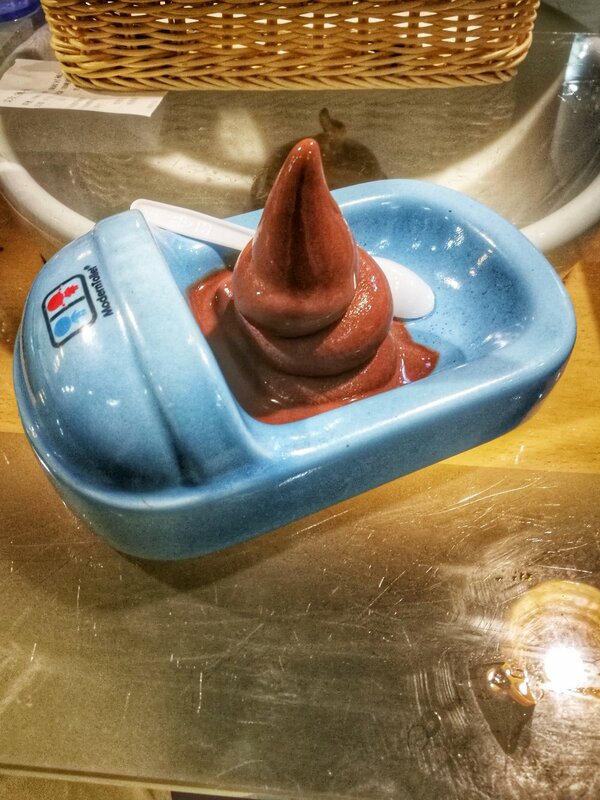 Soft chocolate ice cream served in a miniature urinal. Although Ximending has an abundance of shopping and eateries, it tends to very commercialised. If you want more local fare and dare to try things like snake meat, you can head down to Huaxi Night Market to sample them. Although we went there, we just could not stomach the thought of eating snake. It may sound tacky but we did visit a themed restaurant in Ximending. We went to a restaurant called the Modern Toilet Restaurant. What you will find in the restaurant is that all its patrons will be sitting on toilet bowls. One stipulation of the restaurant is that all customers have to order at least a main course. The main course comes with a drink and dessert. All the main courses that you order comes in a miniature toilet bowl and dessert is soft chocolate ice cream served in a miniature urinal. We did not have high hopes for the food as you normally go to such restaurant to experience the theme. However, the food served at the Modern Toilet Restaurant was pretty decent and the price was very reasonable so do give it a try if you're in the area for some fun and giggles. Due to the constant torrential rain, we had to make further changes to our plans while we were in Taipei. We wanted to hike elephant mountain to get an overview of Taipei's skyline but that was not possible due to the low laying clouds. However, we did make our way to Tamsui District located in the Northern part of Taipei and it will take you about 40 minutes to get there from central Taipei. Tamsui still contains many colonial and Japanese architecture. In Tamsui, you will find Fort San Domingo that was built during the Taiwan's Dutch colonial era. Tamsui is renowned for being the gateway to Taiwan's scenic north coast as well as offering great views of beautiful sunset. However, weather on the day did not permit us to experience this. While at Tamsui we also wandered the old streets where you will come across a street art alley and Tamsui church. The church was founded by George Leslie Mackay who open the first Canadian Presbyterian mission in Taiwan in 1872. He made significant contributions to Taiwan in terms of religion; western medication and education. Street art alley in Tamsui. Sleepy Panda at Taipei Zoo. Even though the rain was constant we made plans to head to Taipei's zoo on our final full day in Taipei. The cost of entrance to the zoo was only $60NT (£1.50) per person, it is really cheap compared to other zoo. For instance Edinburgh zoo charges £17 per person entrance fee. One would think that there would not much to see in the zoo with such a low entrance fee. However this was not the case, I feel great Taipei zoo has done it right. By charging a low entrance fee it allows more folks to have family days out at zoo and it would also allow more people to take part in the zoo's conservation program and also educate the public. Even on a rainy day while we were there the zoo was pretty crowded. The zoo was huge and has animals from Oceania, Southeast Asia, Asia, Africa and Antarctic- you could easily take 3 to 4 hours to explore. It's was a really quick and enjoyable first trip to Taiwan. I think we would like to have taken in and explored more of Taiwan in the 2 weeks but we had to balance time spent travelling with the time spent in each place. Although travelling in Taiwan was easy and straightforward, I think I would much rather rent a camper van and explore Taiwan at my own pace instead of being tied by train and bus schedules. However, the idea of a camper van does not seem to be offered in Taiwan. The last frontier of Singapore 🇸🇬 - Pulau Ubin.